Archaeologists think they found the Garden of Eden! Or at least, a temple that is 11,000 years old. Prehistoric people would have gazed upon herds of gazelle and other wild animals; gently flowing rivers, which attracted migrating geese and ducks; fruit and nut trees; and rippling fields of wild barley and wild wheat varieties such as emmer and einkorn. "This area was like a paradise," says Schmidt, a member of the German Archaeological Institute. Well, if not the garden of Eden, the oldest known holy place. Good rebuttal of a call for a ban on breastpumps for nursing mothers in the workforce, by women who "feel like cows". It was hard enough to get employers to accept women pumping at work; if you don't like it, don't do it- but don't make it harder for others! I *think* that the point the writer of the original article was trying to make was that there should be long, paid maternity leave for 6 months. Which I also have a problem with, even though I am a woman who nursed while working and didn't get enough maternity leave because it was unpaid! Obama's Education Secretary wants to expand the second worst legacy from the Bush administration - No Child Left Behind. Of course, it involves expanding federal involvement in education. "We need national standards, and assessments to measure them," Duncan said. "The idea of having 50 states designing their own standards is crazy." No, more testing and letting the Feds decide what an appropriate education is for my child is crazy. Dresses only? I never considered all of the perks...10 Reasons Skirts Are Better Than Pants. Related but belated is this post from Taliban Rising, which examines some of the more extremist views on women held by some SPPX Catholics. Remember when I talked about someone setting the grass behind our house on fire? Tonight someone broke into the neighbors house in broad daylight, coming from the same place. I was home all day and didn't hear a thing. Even scarier - I let the kids play in the backyard. My boys love going to the water to get critters (I can see it from our house, and I can usually hear them, too!) But what if it was our house they had targeted? I'm 8 months pregnant - what could I do with all these children? Run out the front door? We've talked about buying a gun, but even if we did - I don't know how to shoot and have never touched one in my life. My doctor recommends against shooting classes until after delivery (decibel level and apparently shooting kicks up lead dust, too). (And yeah, I did ask him. This being Texas, he didn't blink an eye!) I'm still hesitant because my oldest is not the most responsible child. I don't know if the boys should still go down there. There are no parks in my neighborhood or open play spaces and fields. I firmly believe boys especially need to be outside, and experience the outdoor world as often as possible. Miss C hurt her finger, and her siblings are taking good care of her. Mr S is giving her water - holding the glass to her lips for sipping, and the girls are giving her their stuffed animals and books. All without any adult prompting (she split her fingernail - not a mortal wound, after all.) Maybe there's hope for the heathenish tribe, yet! 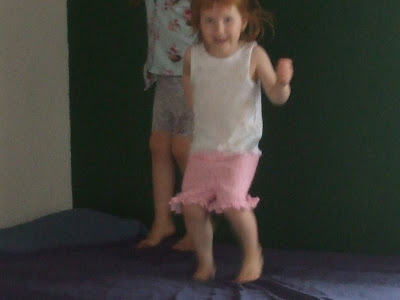 Even if they tattle on themselves by taking pictures of jumping on the bed. 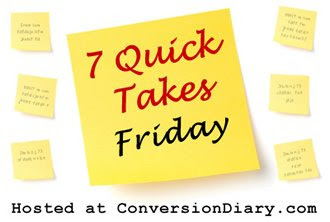 Visit Jen at Conversion Diary and check out the other Quick Takers!